Milwaukie, Oregon is a city of around 20,000 on the banks of the Willamette River. It is a suburb of Portland, largely in Clackamas County. The Milwaukie City Council passed a Climate Action Plan on October 2, 2018, We talked with the city’s mayor, Mark Gamba, to learn more. Why did Milwaukie create a Climate Action Plan? From here on out, everything we do will be through that lens. It became obvious that we need to start developing strategies to move toward the vision. The first step was developing a Climate Action Plan, and we’re now creating a comprehensive plan that integrates the Climate Action Plan and addresses other parts of the city’s vision. What are key elements in the plan? We have three goals: Net zero electricity by 2035, net zero building energy by 2040, and carbon neutral on all fronts by 2050 – city-wide, not just city operations. It’s a big lift, especially since 35% of our carbon footprint is from industries in the city. How does the Climate Action Plan help your city? Climate is the biggest existential threat facing humanity. We need to plan for mitigation and resiliency, to address the underlying problem and also to deal with the change that’s already happening. 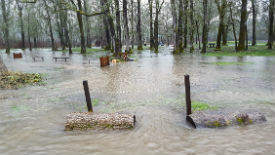 We’re already feeling the effects of climate change in Milwaukie. For example, a record-breaking rainstorm in 2015 washed out the footing on a bridge. It was caused directly by climate change. The city just finished repairing the bridge, and it cost $2.6 million. More specifically, the things we do to address climate change will make the city more livable and equitable. We’re making a huge investment in bike and pedestrian infrastructure. Over the next 9 years, we will be spending over $50 million on transportation, focusing on Safe Routes to Schools and meeting ADA standards for disability access. We’re building walking and biking paths by shopping areas, multifamily residences, schools, and other key locations. In the next nine years, people should be able to get everywhere in Milwaukie safely. We’re also increasing the city’s tree canopy. The canopy is currently at 26%, and we’re aiming for 40% canopy. As part of that, we’re developing a new tree code that protects trees – including on residential property. Many of these processes started even before the Climate Action Plan. They’re good for our community. People will feel the pleasure of shaded, cool streets, and will have less storm water flushing down their streets. They will enjoy bike lanes, bike paths, and safe places to walk. In nine years, I expect Milwaukie to have the most walkable and bikeable city in Oregon. How is Milwaukie accelerating the shift to renewable energy? We’re partnering with our utilities, Portland General Electric and NW Natural, and pushing them to have only renewable energy coming into Milwaukie. The point isn’t to shift the dirty energy elsewhere, but to build renewable resources. We have acres of flat roofs that are dying to be filled with solar. We’re trying to install significant solar arrays, but many businesses are in buildings they don’t own. So we’re hoping the community solar program rolls out in a way that supports these types of projects. If not, we’ll look for other solutions. We’re also partnering with PGE to become a pilot city for a micro-grid. We have a sub-station that controls the hospital, a low income residential area, and a bit of industrial. We’re looking to make that micro-grid have energy storage, quite a bit of solar, and the ability to function separately from the main grid in the event of an emergency. Also, as we build out more low income housing – currently 200 units, with plans to grow to 600 units – all of the new units will be smart buildings, which will allow PGE to use an interactive grid to balance the energy load. We think we can fund the construction if Metro’s affordable housing bond measure passes this November. Where will the challenges be? Natural gas [also called fracked gas because two thirds of the gas in the US is produced through fracking] is problematic. People consider gas a greener form of energy because it produces lower carbon as it burns, but the problem is upstream. The gas leaks, releasing methane – a greenhouse gas that’s 84 times more potent than carbon dioxide over 20 years. There are ideas being explored, but no solution yet. Partners are key to making many of our goals happen. That’s why we had NW Natural at the table to develop the Climate Action, as well as PGE and the city’s largest industrial customers. Ultimately none of them opposed the plan, and PGE testified in support. We’re also pre-empted by the state on many areas of work we should be doing. We’re not allowed to have more stringent building codes than the state requirement for cities. With multi-family building going up, we want them to have things like car chargers and solar panels, but we can’t require it. That’s a big deal. There also needs to be a program in the state where they’re not only requiring new construction to have charging, but also to start retrofitting apartment complexes. Forty one percent of the population in Milwaukie is renters. Without retrofits, most of them are essentially locked out of owning an electric car because they can’t charge at home. Tell me about the new Milwaukie library. It’s an exciting project that seems in line with the Climate Action Plan. 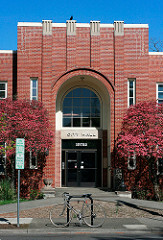 A few years ago, we passed a bond measure to rebuild or remodel our library. The city decided to rebuild due to expensive seismic issues. Every new public building needs to put 1.5% of construction cost into renewable energy, and those funds are being used for solar panels. We are also doing the things that would put the building on the path to net zero energy, using an Energy Trust of Oregon program – things like an energy efficient envelope, solar panels, and efficient HVAC, lighting, and orientation. We’ll save enough money on energy costs that the investment will pay for itself in about a decade. We’re going to meet or get close to net zero, which would mean the building is so efficient it will produce as much energy as it uses. It doesn’t take as much as you’d think to make new buildings net zero. The new library is happening now. The books are being moved out this week, and the current building will start to be torn down in the next week or two. We’ll have a great new library in 18 months. What can other cities learn from Milwaukie’s experience? The biggest piece of advice I would give is to start with a robust visioning process. We held several town halls, and did outreach to all kinds of stakeholders, including civic groups, schools, neighborhoods, Spanish speakers, and more. With all that outreach, by the time we got to the Climate Action Plan it felt like a project that everyone was working on rather than something we need to fight about. I’m also working with a group of elected officials who care about climate change called Oregon Climate Cities. We work to find, educate, and empower climate champions throughout the state. We also provide leverage on statewide legislation, such as the Clean Energy Jobs bill. The more we can empower those individuals, the more pressure we’ll be able to put on the places where we need to create change. We need as many allies as we can, aligned on their views and chasing the same goals.